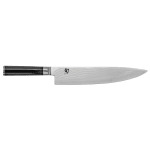 Shun Classics Chef's Knife, 10" blade, VG-10 cutting core clad with 32 layers SUS410 stainless steel. "D" Shaped Ebony-black PakkaWood handle. Dishwasher safe.